A stunning collection of multi-instrumental lullabies to the untamed landscapes that surround them, Snowdonia-based four-piece release second album, written and recorded in the Welsh mountains and announce a string of festival dates. Led by the poetic heart and musical mind of Dilwyn Llwyd, the four-piece reveals a masterpiece of sweeping instrumentation, soaring choirs and shimmering string sections. Written and recorded in North Wales throughout 2014, the album succeeds the band’s 2007 self-titled debut, famed for being mastered in the swimming pool studio of friends, Sigur Rós. All but one of the tracks (the stunning Word Song) is delivered in Welsh, causing non-native ears to drown in the simple melody of the words. Llwyd’s gentle brogue, delivered in restrained tones is set against shimmering backdrop of the band’s morning dew melodies, each unravelling slowly to reveal the most celestial of musical sensations. 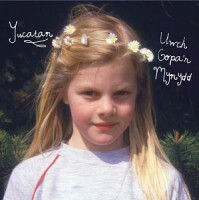 Produced at Bryn Derwen, Bethesda by David Wrench who mixed Mercury Prize-nominated albums FKA Twigs’ LP1 and Jungle’s self-titled debut, as well as Wales Music Prize winner Week of Pines by Georgia Ruth, the first single from the album, Angharad will be released on Monday 1 June 2015. The band have attracted the attention of The Charlatans lead singer, solo performer and occasional coffee shop owner, Tim Burgess following an encounter in summer 2014. He says: “Such a good album. There's a magic to Yucatan's music. A kind of uplifting melancholy that takes you to beautiful places."